Clark Kent is not having a good day. The press conference where he was trying to explain how the deceased Superman had come to him because his life was in danger and thus wanted to switch places with him ended with someone shooting at him. He got his job back at the Daily Planet but it turned out that the man giving him the lie detector test was Batman in disguise. His interview with the CEO of Geneticron, Mr. Bandu, went nowhere. Then he evaded guards and gunfire as he sneaked back into Geneticron and was thrown off a building for his troubles. Luckily Superman caught him and now the Man of Steel wants to talk. Story - 5: Clark Kent has always been one of my favorite aspects to the Superman legend. From the time I was a little kid watching the movies to when I was a teenager devouring the comics to now when I'm forty and still in the trenches with the comics and the movies Clark has been one of those things that, to me, is essential to Superman as a character. To be fair I prefer a more George Reeves/Post Crisis take on the character (minus the football thing which I have grown to dislike) but in any iteration Clark is Superman's link to being human. This is why the whole GROUNDED storyline never scanned for me. Clark lives among normal people every day. Superman doesn't buy a cup of coffee from a street vendor. Superman doesn't interview someone that just lost their home in a fire. Superman doesn't shop for groceries. Clark does and when he's handled right the character is engaging and entertaining. So it should come as no surprise that I really enjoyed this issue. The mystery of who this Clark Kent is has me hooked to the point that I'm not trying to figure out what's going on ahead of time. I really want to see how this plays out and be surprised at the revelation when it happens. While this issue didn't reveal much it did give us a solid tale of Clark Kent evading gunfire and fighting with guards while searching for a story. Jurgens made me like this version of Clark and I actually feel bad for him because he's just trying to solve a mystery and between the guy taking shots at him at the press conference to having to take a lie detector test to getting thrown off a building he just can't catch a break. Not that we want him to. It would be pretty boring if he got his answers without having to work for it. Still...I feel for the guy. I also liked that Jurgens told the story from Clark's perspective. This makes Superman a looming presence in the background. Not threatening but not necessarily friendly either. It made Clark's plight feel more authentic. If we had been getting Superman's perspective in addition to Clark's that final page wouldn't have had the punch it did. This also makes Superman somewhat mysterious, which isn't how he is usually portrayed. It's strange to have a story where Lex is the magnanimous one and Superman is the one playing games. All of this came together perfectly. Finally Jurgens slips in another little Easter Egg from the nineties in the form of Mr. Bandu, the CEO of Genetricron. Savitar Bandu was a character from the nineties that went by the name of Shadowdragon and played a huge part in the Death of Clark Kent storyline. He was an honorable character that was sometimes at odds with Superman. I'm not sure if Jurgens has any plans for Mr. Bandu beyond the short scene in this issue but it made me smile to see the name in print. In short this was another great issue that had me engaged as a reader. Jurgens did not miss a beat with this first chapter of a new story. He even threw in some other mysteries like who is the bearded guy in the baseball cap that was at the press conference and watching Superman catch Clark at the end of the issue? Once again I am in the position where I can't wait for the next issue. I know I keep saying that. I like that I keep saying that. It means that ACTION COMICS is good again. Art - 5: After six issues of Superman fighting Doomsday with help from Lex and Wonder Woman it's nice to see a more everyday approach to the art. I'm not saying one is better than the other but this issue was mostly a guy in a suit running around and getting into trouble. Zircher made all of that dynamic and exciting. His take on Clark Kent is great. He's a bit nerdy but not too mild mannered. The various expressions that Zircher gave him perfectly matched the mood of the scene. 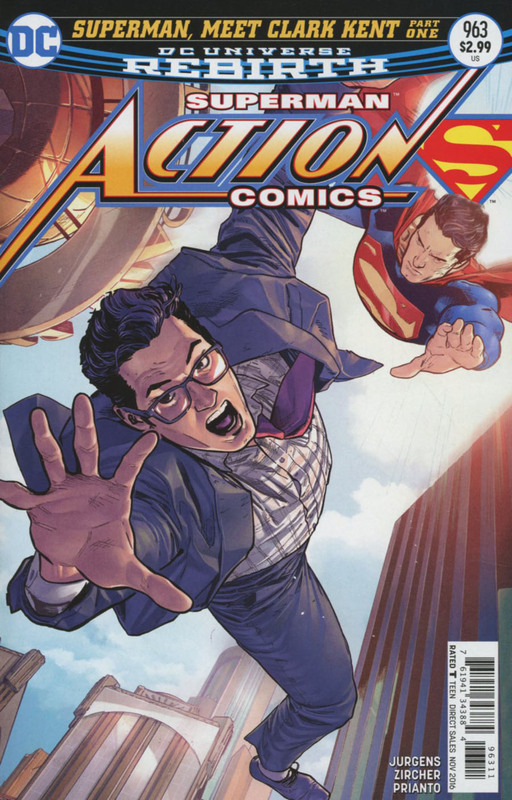 It's not easy making a bespectacled reporter look heroic but Zircher pulled it off in this issue. Cover Art - 4: Superman looks a little off but overall this is a great image. The look of fear on Clark's face comes through nicely and it is just a dynamic piece that perfectly sets the tone for this storyline. Variant Cover Art - 5: Another great variant. 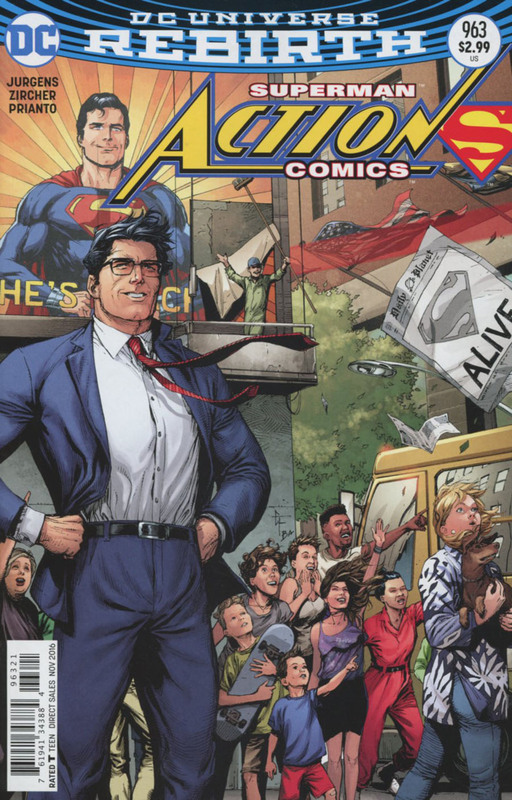 I love the mirroring of Clark on the ground and Superman on the billboard and there is just something cool about a bunch of people looking to the sky with awe and wonder. I'm also glad that Gary Frank has moved away from drawing Christopher Reeve as both Clark and Superman as I always found that a bit unsettling.